Charles Ernest Brinkman spent parts of six seasons as a backup catcher in the major leagues, all but four games of the last season with the Chicago White Sox. Despite a .172 career average, he remained in the majors as long as he did on the strength of his stellar defense. Brinkman split the balance of the 1969 season between Tucson in the Triple-A Pacific Coast League and Columbus in the AA Southern League, hitting a combined .237 in 51 games. 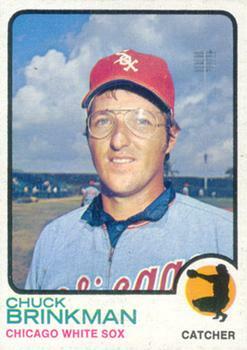 His first major league start came on May10, 1970, in a loss to the Orioles in Baltimore. He started again on May 27, but spent most of the summer at Tucson. Recalled in September, he made four starts behind the plate and had five hits, which raised his average to .250 in 23 plate appearance. That turned out to be his career best. As of August 2018, Brinkman continues to run his own sporting goods wholesale business from his home in Bryan, Ohio, a county seat between Fort Wayne and Toledo in the northwestern part of the state. He and his wife of 48 years have lived in their home there for decades. Brinkman said he rarely gets to a big league game but sometimes drives to Toledo to see the Triple A Mud Hens or to Fort Wayne to see the Class A team there. “I can park my car for $5 and pay $4 for a beer,” he joked. He has season tickets to Ohio State football games and often stays with college friends when he goes. Thanks to Chuck Brinkman for his help with this biography, which was edited by Tom Schott and fact-checked by David Kritzler. 1 Telephone conversation, author with Chuck Brinkman, August 30, 2018. 2 Chuck Brinkman’s player file, National Baseball Hall of Fame Library, Cooperstown, New York. 3 Jerome Holtzman, “Sub Catcher Brinkman Unsung Hero of Chisox,” The Sporting News, September 18, 1971: 17; see note 1. 4 John Cannon, “Talk of the Teens,” Cincinnati Enquirer, February 11, 1962: 43; Gary Schultz, “Budde On Top In Legion Race,” Cincinnati Enquirer, June 23, 1962: 22. 5 Jim Van Valkenburg, “Ohio State Defeats OSU in Title Game,” [Pocatello] Idaho State Journal, June 20, 1966: 7; Brinkman’s Hall of Fame file. 9 “White Sox Send Ex-Cat Hinton to Toros,” Tucson Daily Citizen, March 31, 1971: 54. 11 John Brockmann, “Same Old Tanner . . . He’s Still Optimistic About Sox,” Sarasota FL Herald Tribune, February 27, 1975: 50; ibid. 13 Eduardo Moncada, “Zulia Pitching Staff Shows Zip Under Billings,” The Sporting News, January 29, 1972: 47; ibid. 14 Roger Farrell, [De Kalb, IL] Daily Chronicle, January 16, 1974: 17. 15 “Brinkman Keeps Sox in First Place,” Lakeland Ledger, May 23, 1973: 1B; “Chisox’ Bahnsen Wins Sixth With Three-Home Run Help,” [Lafayette, IN] Journal and Courier, May 23, 1973: 37; Georg Langford, “Orta Leaves ’Em Talking; Sox Win, 6-1,” Chicago Tribune, March 5, 1972: 106. 16 “Bucs Purchase Sox’ Brinkman,” Pittsburgh Press, July 11, 1974: 23. 17 “Brinkman Sent Down by Bucs,” Indiana [PA] Gazette, August 7, 1974: 19. 18 Bill Smith, “Catch Rule Catches Outfielder,” Charleston [WV] Daily Mail, August 23, 1974: 1D. 19 “Sox Notes,” Chicago Tribune, May 13, 1974: 87. 22 Chan Keith, “Catcher rejects Twins to keep selling toys,” Minneapolis Star, December 4, 1974: 81. 23 Ron Bergman, “’Lucky to Be Back With A’s,’ Beams Toy-Vendor Lindblad,” The Sporting News, December 2, 1972: 42. 25 Previous paragraphs based upon telephone conversation, author with Brinkman, August 30, 2018.